My Wild Jade Cutlass Thief, a rogue deck focused on Spectral Cutlass, but with an excellent Rogue matchup thanks to tri-class cards, that always improve Cutlass durability. Given this approach, the Jade Golem package inclusion is obvious, and a burgle-oriented pirate package works wonderful together with Raiding Party for weapon tutoring. Was there such a warning last time as well? Your deck was pretty abysmal to tell you the truth, beside two Stonehill Defenders, you pretty much had nothing. You had very weak minions all across the mana curve and no win condition rly, maybe Wargear on a mech, but that is a stretch. Even if you curved out, and that was a good possibility with good enough early game, one clear and you were probably done for. Only way i could see that deck winning is if you could get Tarim out of stonehill consistently and swarm the board and finish with Tarim, but i guess that didnt happen. Yeah indeed, though I got Tirion twice, but that didn't matter: in one case it got Polymorphed, and in the other one my Paladin opponent used the spell that changes a minion to a 3/3 and had too many minions on the board for my Tirion to be relevant. I was checking Arena tier lists during my picks and indeed besides the Stonehill Defenders there wasn't anything crazy good. I picked every non-horrible T2 I could. They didnt give the free ticket plus the rewards? I actually got my rewards and free arena ticket. If this free ticket is not for everyone as a new year celebration gift, then OP advice worked. Thx! I left an unfinished arena 3-2, when I logged in a while ago after the expansion was launched, I saw I had two unopened rise of shadows pack. One of them was from the tavern brawl, and I assumed the other one was a launch gift. I opened both packs, bought 50 using gold, and when I had opened 10 and had 40 left, I remembered the arena run. I entered the arena, and still saw my deck, but I couldn't play with it anymore. Instead, by pressing the key I got my rewards: a ROS card pack and some gold and dust. But when I went back to the "open card packs", I still had only 40 left to open. So can I assume that extra pack I had when I logged in, was the one from the arena run? 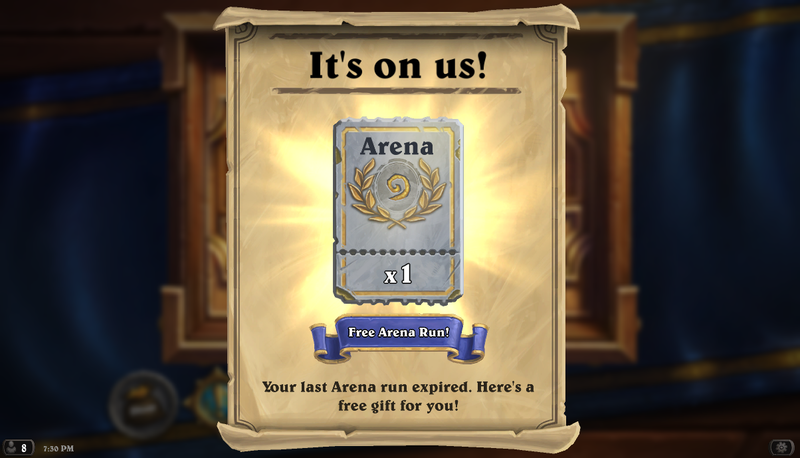 I also got the free arena ticket, by the way. This trick didn't work for me unfortunately. My arena game is still at 0-2 and I started the arena 24 hours before the new expansion. They did give the free arena ticket for unfinished run! But the pop-ups are bugged, log out and back in 2nd time to make them appear! I didn't get the pack. Anyone else? Agreed - I got the ticket, but didn't seem to get the pack. Edit: disregard... just read above. I got it when I opened HS. 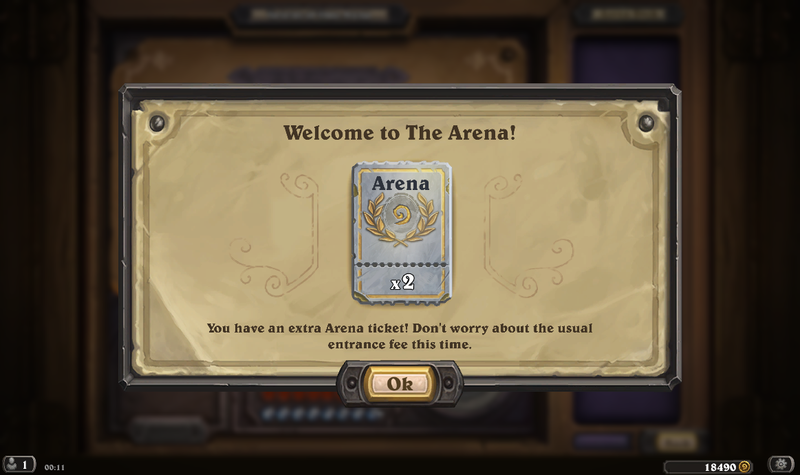 You could just click anywhere on the arena screen and get the rewards. Question: can you stack arena runs? So for example we will be given a free arena run if we left one unfinished prior to launch, but what about when you buy the shadow bundle which also comes with an arena run. Will you be given two free runs in this case? Yes, arena tickets do stack. I have 4 of them in my US/Asia regions each for example. I got my rewards as well, but the deck I received disappeared! What should I do?